A Sound Table is a massage table with powerful low frequency speakers mounted on the bottom of the table. The table itself acts like a speaker sending healing low frequency vibrations throughout every cell of your body. 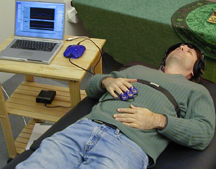 Sound tables are used in vibroacoustic therapies, which are treatment methods based on the combined effects of music and low frequency sound vibration. Auditory and vibratory stimulations are applied to the body to achieve physical and psychological results. Since the 1980’s, the use of vibroacoustic equipment has spread across the globe. It is used in a wide range of settings, including hospitals, hospices, spas, and centers for massage therapy, sound therapy, alternative health, yoga, physical therapy, and psychiatric treatment, and by individual therapists. Creating and selecting sound and music to play through the table is very important. Globe Sound Healing Institute has leading sound healing instructors as well as top Recording Engineers and Producers on our staff. We are very particular about the quality of the sounds and music that we put through your body – very particular! • Musical modes that create specific types of feelings and emotions. On going since 1995, the National Institutes of Health runs the most extensive program in the U.S. for vibroacoustic pain and symptom reduction, treating over 50,000 patients per year. In measuring the physiological and behavioral effectiveness of these interventions with 267 patients, Dr. Patrick George found over a 50% reduction of pain and symptoms. He theorizes that this pain relief is relaxation-induced. 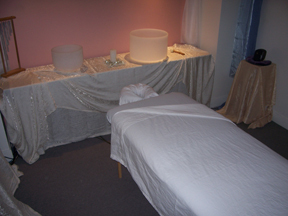 Interviews with massage therapists find consistent themes in the use of sound tables to enhance therapies, encouraging muscles, facial and connective tissues to relax more quickly, and increasing the deepness and duration of the massage effects. They often note that it reduces their physical effort, as the sound table is like having an extra set of hands.